On Friday the calendar proof arrived! Venetia and I looked through it and all the images are vibrant and look gorgeous which means that today (Monday the 18th) it is going to press and printing. You can order the calendar through the Clarion Indiegogo Here. UPDATE: The calendar is now on sale HERE. After a short morning flight from Reyjkavic and the necessary adjustments to my phone, we began our trip from Heathrow into London proper. The long tube ride punctuated by the posh recorded voice of an eloquent woman saying, in the loveliest way possible, “Cockfosters. This is the line to Cockfosters” at every one of the many stops. Nap. Surprise! 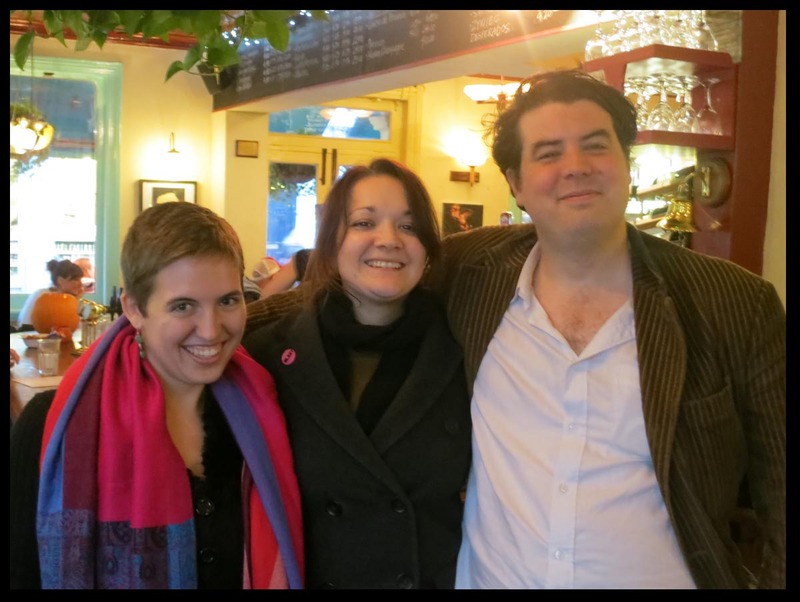 We awoke in time to meet up with our International Discworld friends Richard and Amy. From Charing Cross and Nelson’s fabled Column, we through the Strand, stomped by the Savoy, and dodged as artfully as we could through ancient tunnels filled with Friday Night revellers and spilt ale. After a Bistro dinner and delightful tale-telling, we wandered east to St Paul’s Cathedral (sight of shenanigans in Robert Rankin’s recently-read The Japanese Devilfish Girl and Other Unnatural Attractions) by way of the Twinings Tea offices and Fleet Street, admiring architecture high and low. 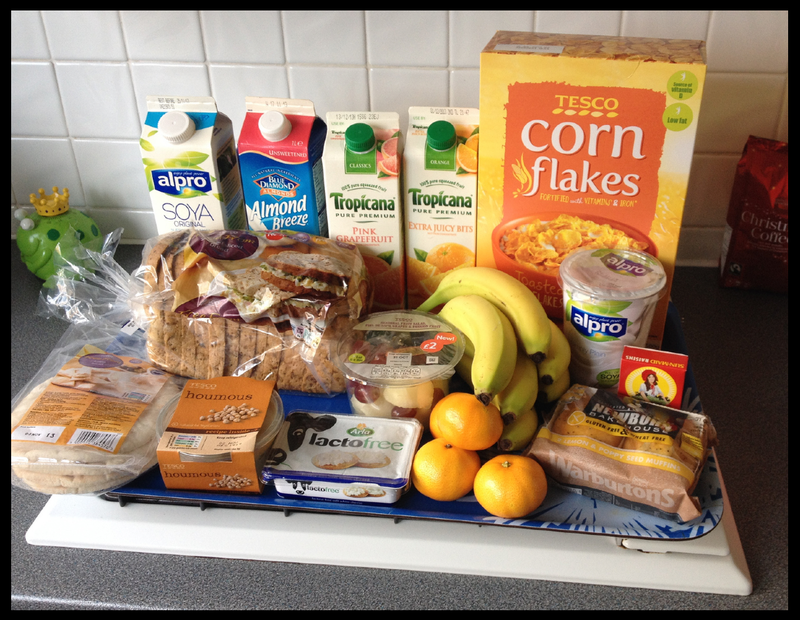 After Cornflakes in the Sapphire Hotel (not much else we can eat these days it seems, with eggs and gluten counterindicated by doctors), we packed our bags and headed up the street in Shepherd’s Bush (is it just me, or does everything in London sound like a euphemism?) 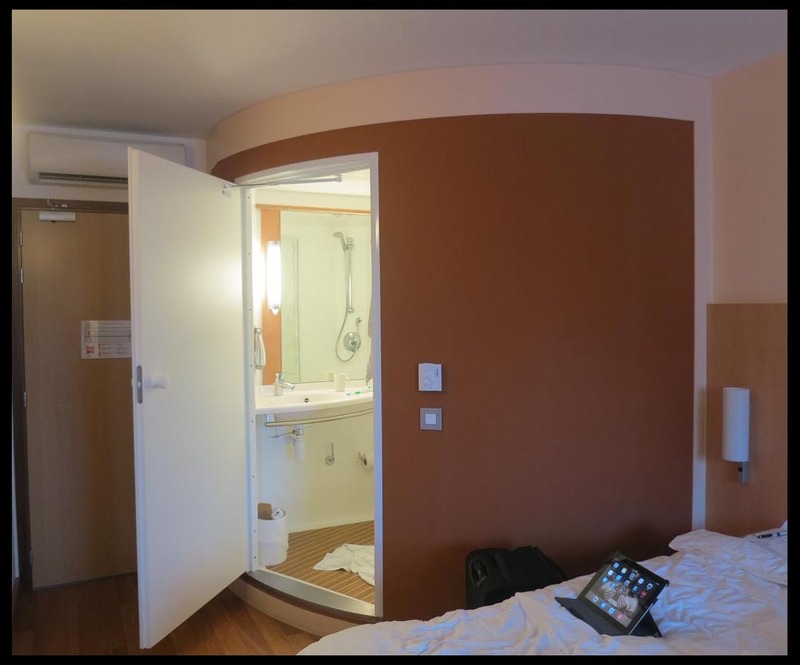 to the vastly more-expensive Ibis Hotel. Given how limited our choices were, I suppose we should thank our stars we found a room at the inn at all. Then, duly ensconced, we headed out to lunch near the National Theater at Waterloo with Jessica Rabbit, who we had met en route to Cairns Australia earlier in the year. We had an absolutely splendid time with her – walking about with the tourists in the food markets and hearing tales of East Indian parades, talking US politics and UK Remembrance Day. When we tried to travel to the Docklands for a long-anticipated meeting with Aly Fell, we were foiled. The Docklands Light Railroad was closed, and our attempts to circumvent the closure were met with an almost farcical lack of knowledge and savvy by the staff of the train lines. So, we made the sensible decision and called it a day. We got amazing (and gluten-free) Ethiopian food upon our return to the Bush (do they call it “the Bush”? We would in the US I think). Ethiopian seems like one of the best cuisines for current diet, though gluten is often mixed with teff for injera, so even it is not foolproof. After our daily allotment of napping, we lounged in bed, wrote blogs and drew Small Gods and wondered if aliens would soon be arriving in our bathroom pod. I had met Maha many years ago in Laurel Maryland, but I hadn’t seen her since her days in the south of France, and I’d certainly never met her wife Sinead. 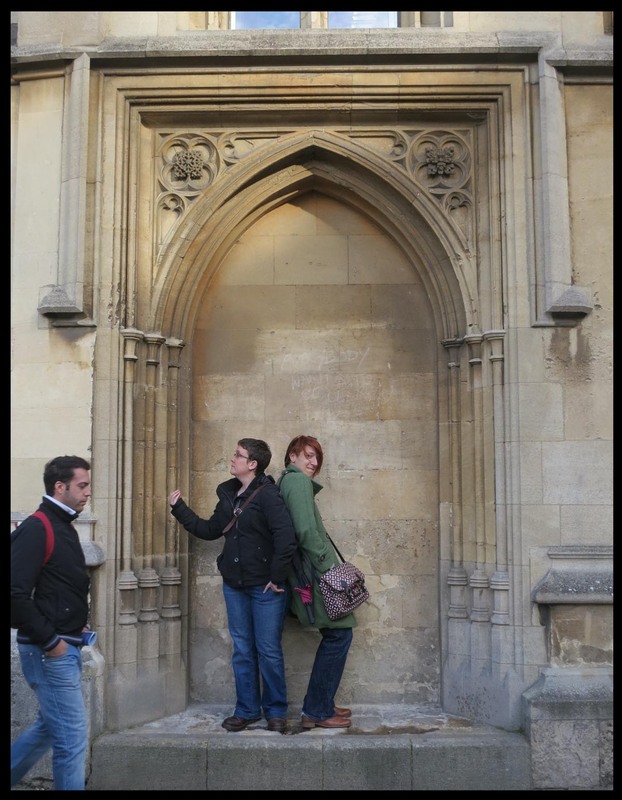 While they had not loved their time in Oxford (where Class is less something one attends than something one is born into), they knew it well and were exceptional tour guides. And while I had not expected to even be in Oxford (we’d met them there only because they had attended a weekend wedding), the timing proved incredible. 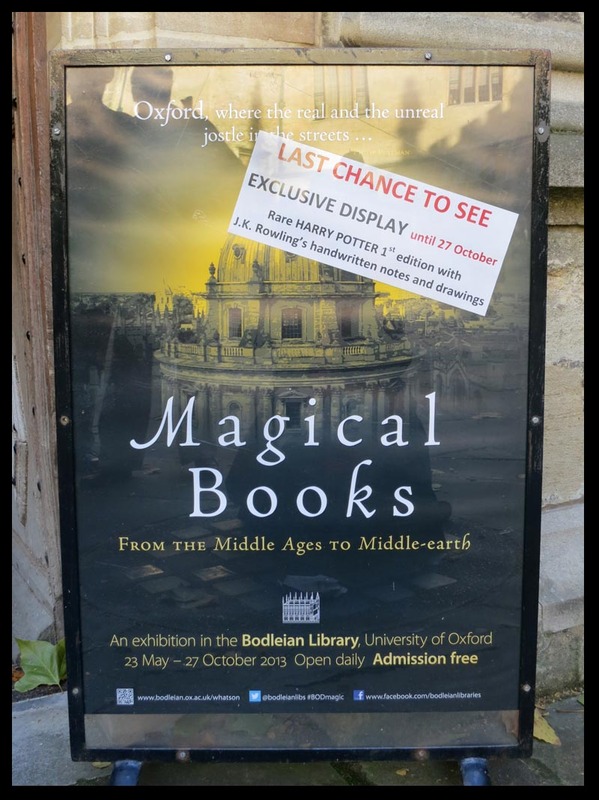 As we wandered the city and campus (technically one of the campuses), we came across the Bodleian Library, and the most surprising and exceptional exhibit – Magical Books. It was not a large exhibit, but oh what a trove! After a look to the Oxonian halls that served as Harry Potter sets, we took a all by the park where we saw cattle seemingly unchanged since they’d been the subjects of paintings hundreds of years earlier. We saw deer and cranes, and what Maha assured us were loads of entitled young bounders in boats, rowing. We arrived in time for takeaway Indian dinner, and a Sunday evening tradition: a group of musical aficionados gather by their laptops and listen to music from around the globe. This week, in honor of horror and encroaching Halloween, each member had contributed a song that truly scared them. And the variety was great – The Bonzo Dog Band fought Eurotrash metal. Children screams and wailed. The uninflected voices of sober scientists gave terrifying news and people shivered in rooms from America to Norway. And saddest of all, we learned that Lou Reed had died. Strangely, Liz had chosen a song of his for the folio, and we raised a toast to him. Later we watched ‘University Challenge’ (which I would not do again. It felt like the loathsome rich kids in the ‘Seven Up’ series wailing on the much nicer and much poorer ones. Besides, my time of caring exactly which year something happened is long past), and ‘Only Connect’ which I loved and enjoyed playing along with. Though having Matt and Liz and Venetia on our team was surely the key to the Home Team’s victory. We ended the evening with ‘Nevermind the Buzzcocks’, the first time I’ve ever seen it new. I enjoyed the music magazine ‘The Word’ while I was there too – especially the lead articles on Ray Davies and Richard Thompson. Such a delight to be in the home of such music lovers! Liz greeted us at noon the next day with a tray of food we could (and indeed would) eat! The variety was astonishing and delicious. Venetia made the acquaintance of Nutella, and the two hit it off admirably. After breakfast and talk we ventured forth with big plans to see the sights of Birmingham, England’s “Second City”. But we did not take in the grandeur of the classic artworks and ancient churches, not even a little. Instead we stopped in Sparkhill intending to run an errand or two, and found ourselves entranced by the wonderful shops food and people. 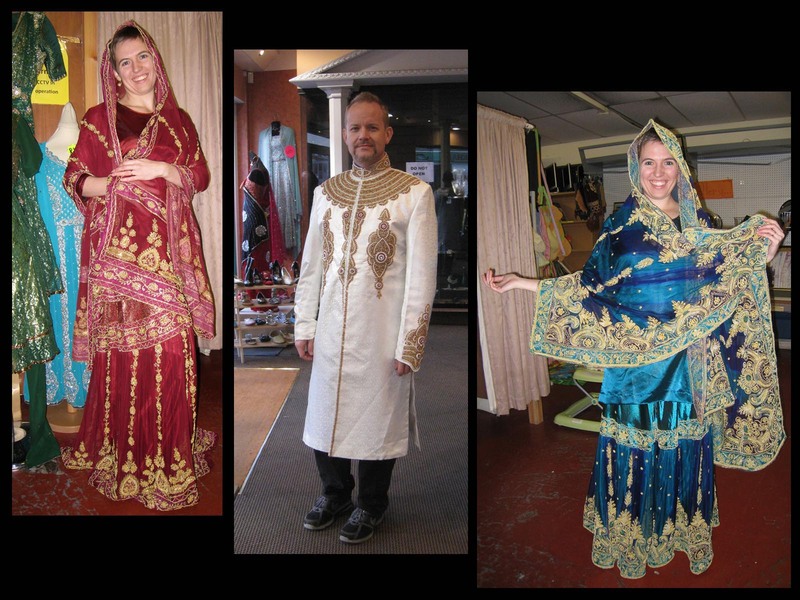 While Liz helped Venetia try on suits and saris in the Islamic Charity Shop, she had a dreadful pause to think “oh no. I’ve left Lee out there with all those devout Muslim ladies!” She needn’t have worried of course. After some respectful conversation about mirrors and their mountings, Liz found me “holding court”. 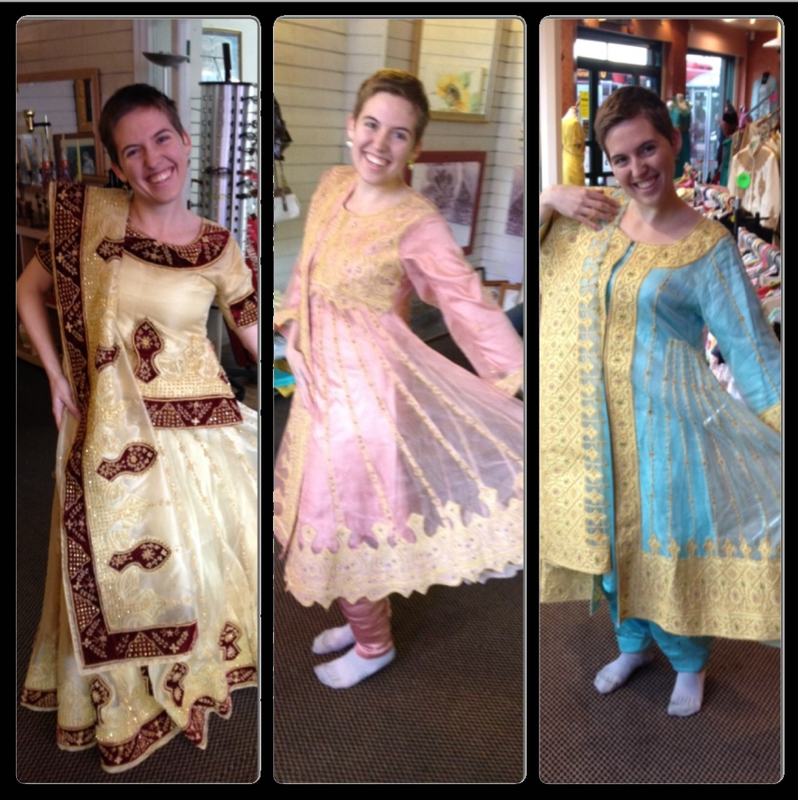 Most happily, the ladies in question were so enchanted with Venetia’s pixie self in the first outfit, that they sought out others they felt would be better choices for her complexion- returning swiftly with dresses in “more Mughal” colors. Happy as we were for the excellent expert advice, the Eritrean woman behind the counter was even happier – she hadn’t any more idea how to fold the sash than we had. I suspect everyone there will be talking about that day for some time to come. I hope so anyway! The next day we slept in while the rest of the house got cleaned, venturing downstairs late, eating and relaxing (and making some Small Gods in advance of the busy convention weekend). But most of all we were watching movies – a rare treat for us indeed. Despicable Me, Big Trouble in Little China, and the most recent Muppet movie. All in the comfort of Liz and Matt’s home. We took the almost unbelievably cheap first class train from Birmingham into London, eating and drinking in right high style, even as I mourned Thatcher’s privatization of the common weal. Strange to think that it has been so long since my 1988 trip, when her menace was ever present. Now her bitter greedy legacy, like Reagan’s in the US, is a fact not just an omen. Should you come to Brighton, do not stay at the “Hilton” Hotel Metropole. While lovely in some particulars (the architecture in the old lobby and breakfast spaces, stairs and bar) the convention space was a pretty ghastly affair – non-Euclidean and a nightmare for anyone with impaired mobility. and our room was a bad joke- an overheated sauna that could not be cooled, a bathroom backlit for one’s shaving convenience, toilets that didn’t flush until the 8th try, faucets that could have used a proper Vice-Grip to use, windows that opened a mere 4 inches, surly service, a convenient built-in drinks refrigerator just to “hold” your drinks, not to actually cool them. But perhaps the egregious scalping of internet service (15 pounds per day here, but free at the less pretentious TravelLodge, natch) was worst of all. No communication with the outside meant no updates, reportage, tweets or any of it. So the account that follows is one from my dim exhausted brain, rather than accurate or up-to-the-minute as I had hoped in advance. I did hear great things about the nearby Granville though. So many lovely people that I cannot begin to list them all. But starting at the beginning, we bid Ewa goodbye and got registered. The hard-cover program book lovely, but both outdated (neither China Mieville nor Alan Lee made it to the show) and deeply impractical for foreign travels given the tiny book bags provided. After a much needed nap we arose for the Early party and took in the lay of the land. Halloween dawned with breakfast in the big hotel dining room where we were placed next to birthday girl (and fashion plate) Shannon Page and artist (or is he still author?) Mark Ferrari. 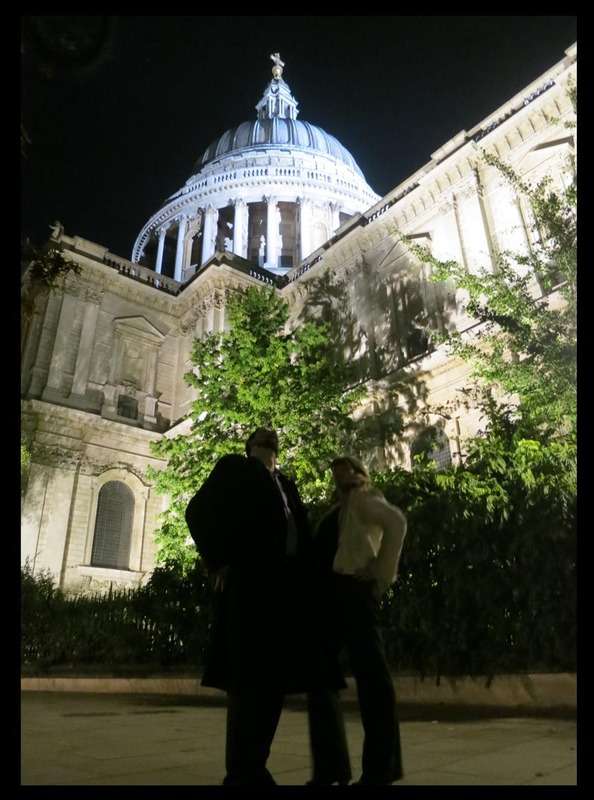 Both had come from Portland, but had come a week early to the country and spent far more time in the mighty Metropolis of London than we. We’d gotten much of the art show hung by the time we met Simon and Julia Indelicate for lunch. Brighton is their old stomping grounds and we spent not just lunch but the better part of the afternoon with them – traveling through town, picking up last minute printing, and admiring the shops. Every bit as interesting as their records suggest, we hope to see and hear much more of them in the near future. That said, before Andri’s house party in Iceland, we’d not heard of the onerous tariffs that the US has placed on foreign musicians. Quite horrible for The Indelicates as well, locked out of the US by trade restrictions. The US – Where trade is apparently everything unless it’s creative…. By the time we returned to the Hotel, the joint was jumping. No longer a few lost souls wandering aimlessly, the volume level was very high and people were getting into the spirit of the convention. Dinner on the first full day was taken with Todd and Rita Lockwood, because seeing people from the Pacific Northwest is clearly easier in Brighton. Delicious lamb and rice and fool…. There was no trick-or-treating, but a few brave souls dressed up and made the evening a little more jolly than it otherwise would have been. The censorious and scolding tone of the Convention’s messaging happily forgotten for a little while. 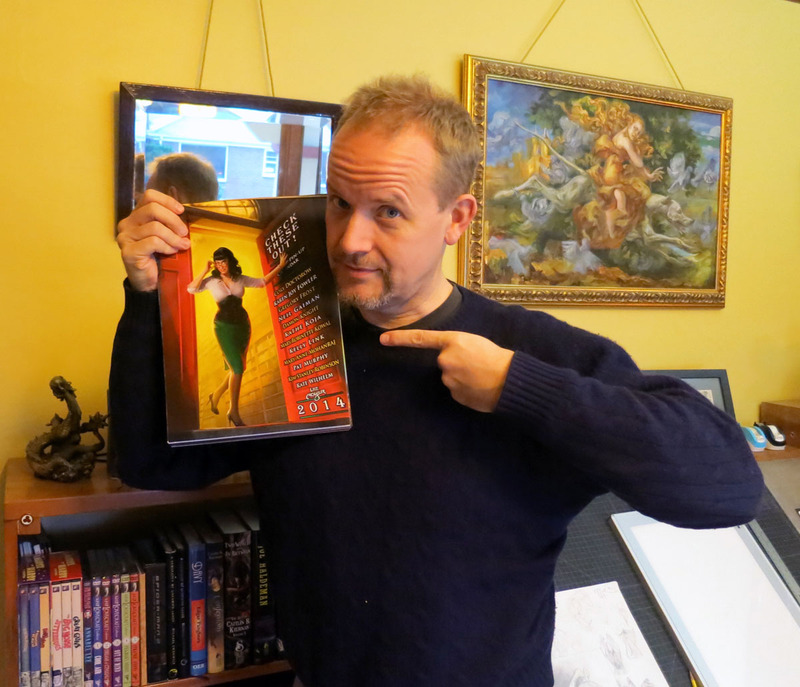 I got to show the ineffable Mary Robinette Kowal the pin-up I’d painted from The Year Without a Summer for the Clarion Pin-Up calendar. And the night of the Mass Signing, We got signatures in the 2013 version from Robin Hobb, Pat Rothfuss and toastmaster Neil Gaiman (whose kind words about my portrait if his wife were most appreciated). Sir Terry Pratchett was briefly glimpsed, but his time is without price, and we are delighted he made it at all. 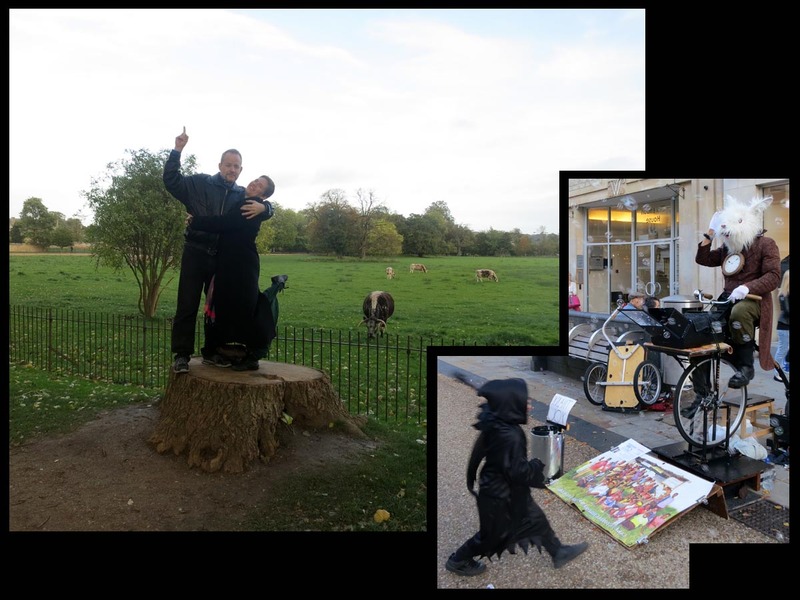 Were that Ray Bradbury had been able to join in around this literary Halloween Tree…. Mary introduced me to author and blue-haired book maven Nene from Malmö in Sweden (the second of the long weekend’s birthday celebrants), and I hope to see much more of her in future. Knowing she will be present in Wisconsin come May tempts me to Wiscon and House on the Rock, but plans for my impending 50th birthday party might make that untenable…. Bird lover that she is, I was delighted to introduce her to her Hawaiian namesake in a rare moment of internet function. The dinners (and occasionally lunches) seemed to fall in thematic patterns – Portlanders (David, Kate, Shannon, Mark), Art Show Staples (even though we went with John Picacio and Tara, we found ourselves across the empty Indian Restaurant with Les and Val Edwards and the Zipsers), DC 2014 World Fantasy Con planners (Peggy Rae, Colleen and …), DC Friends of mine unknown to one another (Nancy Greene and the Zipsers) and finally the infamous Frenemeses category- one from Tel Aviv, one Jerusalem (each would rather die than live in the others city), one Brooklyn, one Riverdale (“you’re such a Jersey Girl” says Barry the agent to Laura Anne Gilman, his client), one birthday Swede, our duly-appointed member of the press in PreRaphaelite glory, and me. Mad fun in a BBQ restaurant that, in striving for verisimilitude with is US counterpart, served obscenely large portions to the shock and awe of all present. In the midst of the madness, I took the time to participate in a fun and quirky project by Shanna Germain and Monte Cook: We Are All Strange. The Art Show space was as well arranged and run as possible, given the peculiarities of the space. Brava to Val Edwards – there was no drama, no fretting and the clear understanding of a dab hand at work. The couches and tables a terrific idea, and the artwork quite impressive – though we all missed Alan Lee, and admit to some disappointment that Greg Manchess left his things at home, it was a real treat to see the works of Pennington, Edwards, Picacio up close. While the Artists reception felt under-attended, those who did attend we’re attentive and interesting. I enjoyed showing Neil Gaiman the portraits of “Good Omens” stars and the Four Horsemen of the Apocalypse, and meeting the wonderful Frenchmen who purchased my work. And it was the French who did, the British didn’t (beyond Neil) seem to care much (a fellow from the Isle of Man suggested it might be too spicy for the UK, but really? Pictures of Doctor Who and Small Gods? I suspect the real answer is a dearth of wallspace, love of books, and an economy that’s still a bit dodgy). Happily, the French Publishers Bragelonne bought 2 of my pieces for their offices, and I greatly enjoyed my conversations with them. Perhaps we can work together in the future. I do hope so. Especially if my intermittent discussions with Centipede Press about doing a book about the sculpture of expatriot Henry Clews Jr. one day come to fruition…. Seeing people from so many countries with a common bond led many to discussions of Family, and reunions we in evidence everywhere one looked. Overall, I’m glad we went and I hope that next year’s version will bring so many from overseas. “It doesn’t GET cold in Australia. This coat is too tight at the arms. Must be my massive guns…. Do you know Harry Potter?” He does. “Well, it’s kind of a… thing in my life. I bought a BIG mug while I was there. The woman at customs didn’t like it. ‘What IS this?’ It’s a mug I replied. You drink out of it…. She was SO unhappy with her life”. We arrived safely in Seattle, where we were rescued at our very low ebb by Rob. How lucky to have such fine friends! 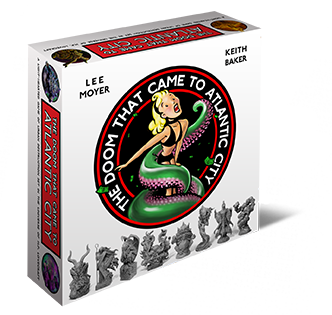 I received a splendid update today from the fantastic Cryptozoic regarding The Doom That Came to Atlantic City. It even has pictures! If you would like to see the grotesque beauties in person, Cryptozoic will be demoing the game at Board Game Geek Con in Dallas, November 20-24.Please go visit (and play!) if you’re in town! We’ve been making some great progress towards creating a beautiful game to send straight to your door. We wanted to keep you in the loop and show you some fun insider photos of what it takes to make a board game! 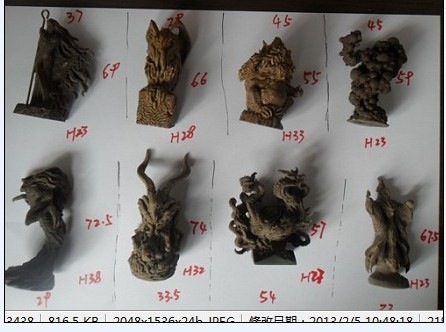 Check out these incredible resin models that the factory has created. These are based on the sculptures by Paul Komoda that we sent to them. The factory used these to create the actual molds for the plastic figures. We have the proof copies of these figures in the office now and will be bringing them with us to Board Game Geek Con in Dallas Texas this week! The detail on these guys is simply amazing. We wanted to retain as much of it as possible while keeping these figures tough to avoid damages in shipping. We also needed to keep the costs within the realm of sanity. After some discussion with the factory, we were able to narrow it down to the correct weight and blend that we feel will provide the durability and cost effective solution we required. We can’t wait to show you the final product! It really helps to work with great factories that have a ton of experience so they can offer helpful advice. The factory we’re using for Doom has created several other great games with miniatures and was recommended to us by some industry friends. We know they’re going to make these figures as scary as possible! We’re getting some more bits and pieces back from the factory soon and will be able to send lots of pictures with our next update. Once all the parts have been approved, we’ll also have a pretty good idea of when the release date will be for the game. We know you’re very excited to find out more so we’ll keep you up to date as much as possible. Thanks again for funding this game and we look forward to offering you more updates in the near future! 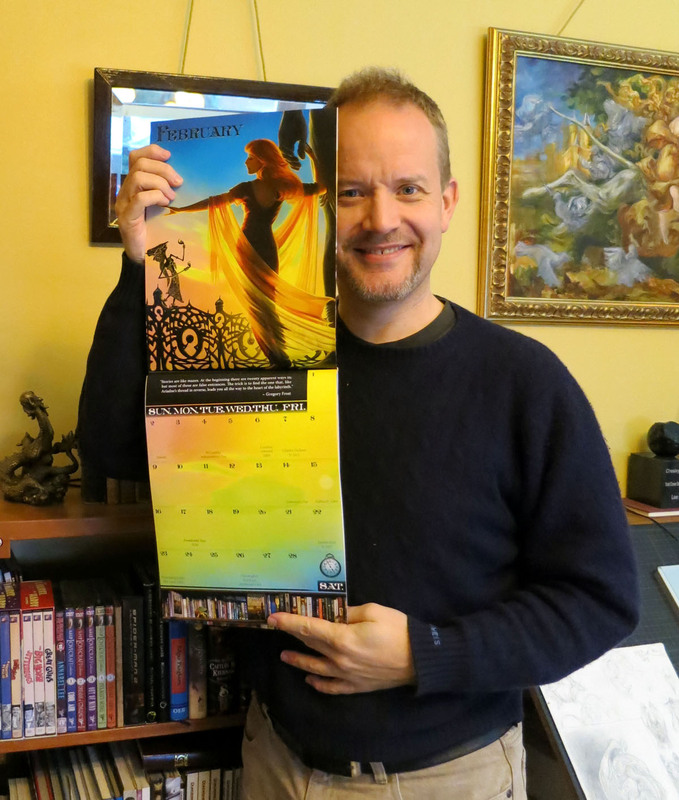 My 2014 Literary Pin-Up Calendar will benefit the Clarion Writer’s Foundation – the very same charity that brought Liz Argall to the states, and has been such a cornerstone to the writing careers of so many stellar talents, in both the writing and the teaching. As with the last two, it is a labor of love. And while the work of the redoubtable Neil Gaiman again graces its pages (this time it’s Neverwhere‘s Hunter) all the other authors are new to the project – from Kim Stanley Robinson to Kelly Link. And I got to illustrate Damon Knight‘s classic ‘To Serve Man’ into the bargain. I’ll spare you the tale of the miracle last-second finish, the broken tooth, and the drive up to Seattle. The birthday dinner with Rob and Lisa’s family for Tessa Tweet, returned from college with friend Talia and sporting a Nabokov shirt, was a much jollier affair – filled with delicious curry, cake and cacophonous laughter. The next morning we commenced the actual packing – making sense of the piles of unsorted foolery we’d tossed into the car in Portland the previous evening. Chris Pramas, rocking the new neck scar from his successful spinal surgery, joined us for lunch in a curious neighborhood in West Seattle. But the North American fun was as short lived as the day itself. Tuesday came to us in Iceland. 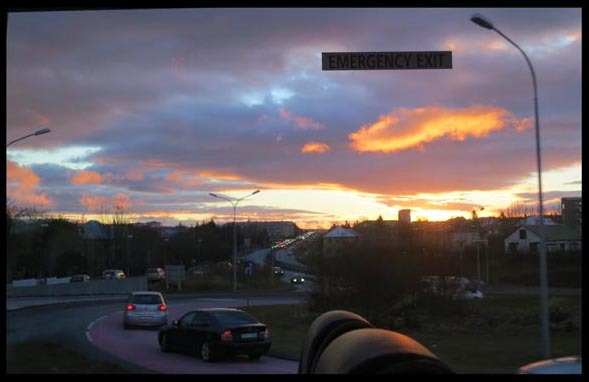 We watched the sun rise (barely and with exquisite autumnal slowness) from the giant window in the front of the bus to Reykjavik – dark and volcanic Iceland giving way to a curious city with just enough Dr. Seuss to temper its IKEA. The Best Western deserves credit for letting us check in so early and suggesting we enjoy breakfast before the inevitable nap. Though we’ve long been used to Venetia’s gluten-free diet, this was first time out in the world figuring out my new food restrictions. Corn flakes with brown sugar, ham and oranges did the job. The nap would prove fiercesome… and habit-forming. But we arose in time for the 12:30 tour. 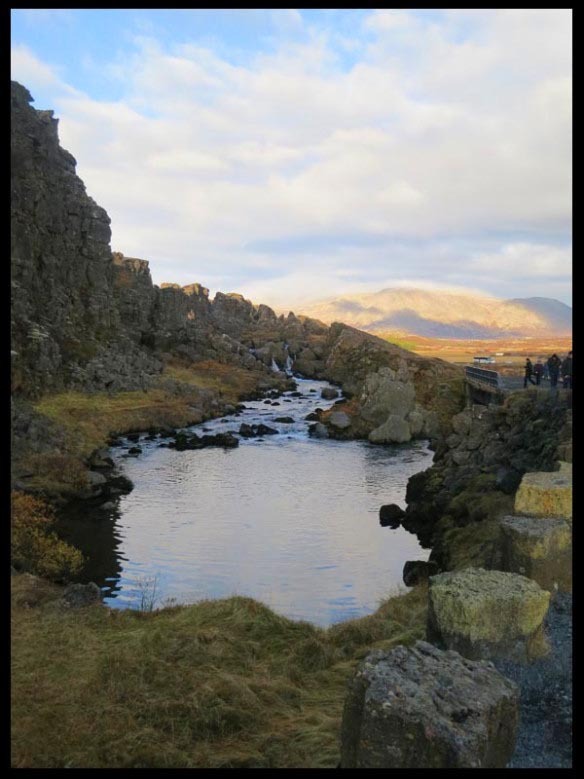 Our brilliant young tour guide spoke French as well as Icelandic and English, but with no Francophones present, it was pure intelligible data. Amid her recitations she suddenly exclaimed “this is my husband and two year old daughter”. She was quite surprised to find them outside the big concrete church that occupies the city’s highest point. It looks deceptively large from a distance but feels comparatively small close up. And oh that autumn wind! 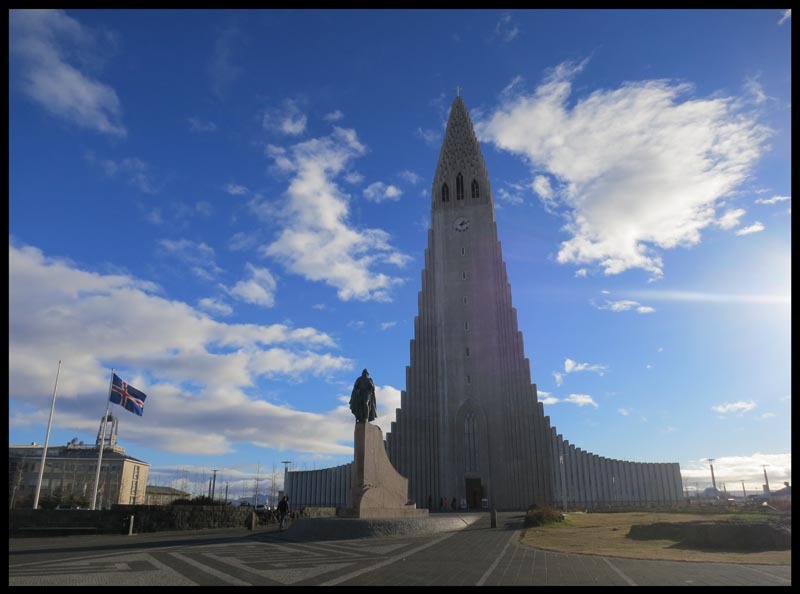 We were startled to learn that Iceland, so progressive in many ways, has no separation of church and state, and that tax dollars regularly roll into church coffers. We were disappointed to learn that those politicians responsible for Iceland vast banking crisis were once again in charge of the island nation, but voters everywhere seem to have short memories. Even here, in a land small enough to see cause and effect with comparative clarity, and through one’s efforts, effect change. 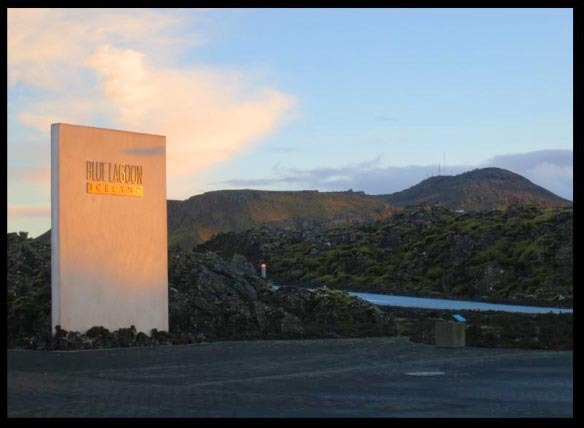 Iceland reminded me of Duncan Jones’ film ‘Moon’ in some ways, and it’s no shock that Hollywood’s ‘Oblivion’ (which also reminded me of ‘Moon’) was shot here. It is a beautiful and fierce place – one that I think every writer of hard science fiction would do well to visit. Where else would they take the 4 enormous hot water towers that supply the reserve geothermal power to run a city and pop a glass dome and spinning restaurant on top of them? We did not enter the Viking recreation “Madame Tussaud’s” museum either, but it made us think strongly of our Norse-loving friends. The city is largely crisp and clean, however there was graffiti everywhere (well everywhere but the trains anyway – it seems that a history of Danes left them with no trains). Apparently waiting until winter to mark one’s territory old-school just wasn’t on. When does it get too cold for the taggers? When do children start being admitted to emergency rooms frozen to their spray cans? And why, in a country so small, is there not an obvious way to dissuade them? Perhaps because there is so much heavy industry. Maybe unlike America, the punks steal their spray cans from the docks rather than buy them in a hardware store. While Iceland’s national politics continue dismal, the city’s anarchist mayor is changing their political culture any way he can. An actor and performance artist pal of Björk, he’s taken city hall to areas heretofore unknown. Sure, a big city mayor might pop on a red dress for a gala in Portland or San Francisco, but actual cosplay? This mayor in his Luke Skywalker get-up would be right at him at the San Diego Comic Con! And after a full term, he still maintains the 30% popularity that got him and his “Best” party elected the first time. 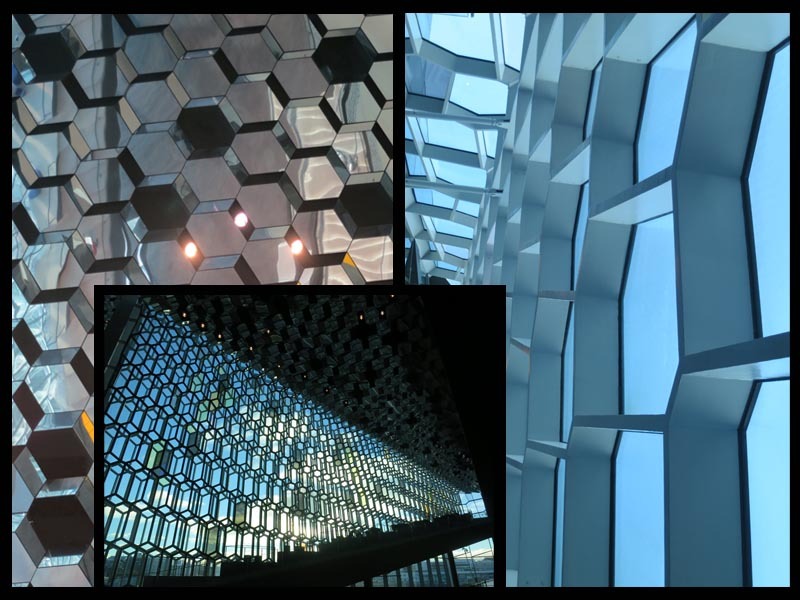 The massive performance hall the ‘Harpa’ ended our trip and proved to be V’s favorite building. It remained unfinished when the economy tanked, but happily for all they found the will (and kroners) to finish it properly. What could follow such a spirited tour of the city? Only one thing. More napping. And then another very different tour (if “tour” is even the word I want here, perhaps “quest” would be better)… In Search of the Northern Lights! Lee (loudly to the driver): We’re moving! WE’RE MOVING! But unlike our previous tour, this one pretty much involved driving east in the dark, and hoping the guide, a crotchety old chap who whistled like a quieter Nordic version of Peter Lorre in ‘M’ and easily set the Icelandic record for sarcasm, wouldn’t too often interrupt the silence of the night, the bright clouds and nearly-full moon. Hoping all the while that there would be the perfect opening in those clouds, and that the moon would not outshine any aurorae. We finally stopped at a man-made pumice parking patch paved amid ancient lava flows where at least 2 other buses would also alight. No Northern Lights had been seen in this part of Iceland for the previous 4 days, and the internet held dire prognostication for this night as well. But there was an opening in the clouds to the north, and it seemed worth squinting into gap as best we could, huddled among the masses of foreigners, yearning to see the lights. At first we couldn’t see anything at all, but our splenetic tour guide wisely took pictures to locate them (as his camera’s abilities were beyond even his own) and pointed out the very hazy cloudlike shape in the sky. But it was incredibly cold, and was that patch his camera detected really a hint of lights, or just reflection of moon light on the breaking clouds? 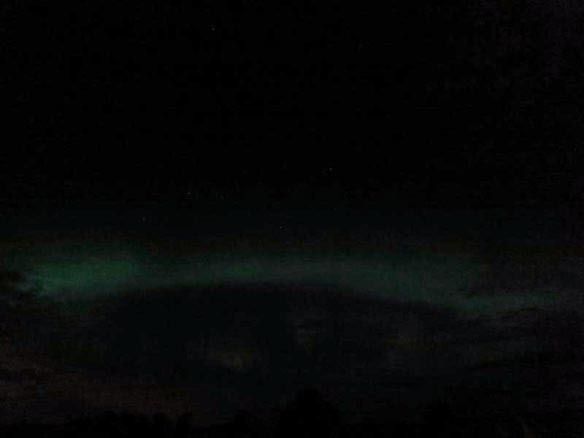 Eventually, the clouds cleared enough for us to see the low wide horizontal smudge that was the Aurora Borealis. 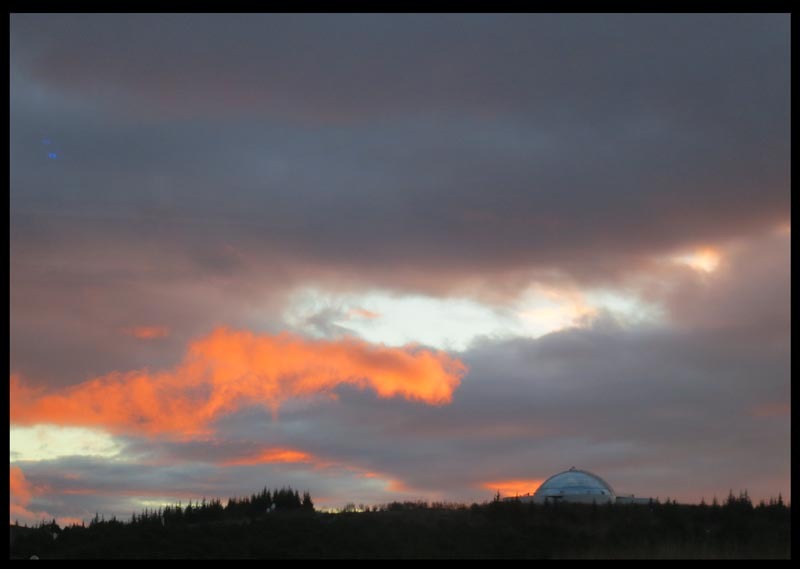 Suddenly a blaze on the horizon of retreating clouds fired up and up. It was joined by others all rising, blazing and eventually, fading sweetly away as other shapes crossed and sparkled in the sky. And all the while the Big Dipper, that enormous shape so familiar in the sky, was dwarfed in every aspect. Several minutes and many configurations later I leaned into to Venetia and said “this is the best planetarium show ever.” And quickly appended “but with the whole PLANET!” The two most surreal and beauteous moments were the Forum – where a long row of vertical pillars were topped by a bold horizontal line, and the Arch – wherein the back of the ladle and stars of the Big Dipper’s handle formed a perfect arched top to two huge pillars of the aurora that stretched up past them into the night sky. If Hollywood (or even Bollywood) had scripted the show we got, I dare say I shouldn’t have believed it. Not since I saw Night on Bald Mountain as an 8 year old child have I been so awed. On the speechless ride back, I silently thanked our lucky stars and thought at length about the arbitrary nature of the universe, about the work of Nicholas Roerich, and about how my own work might change accordingly. 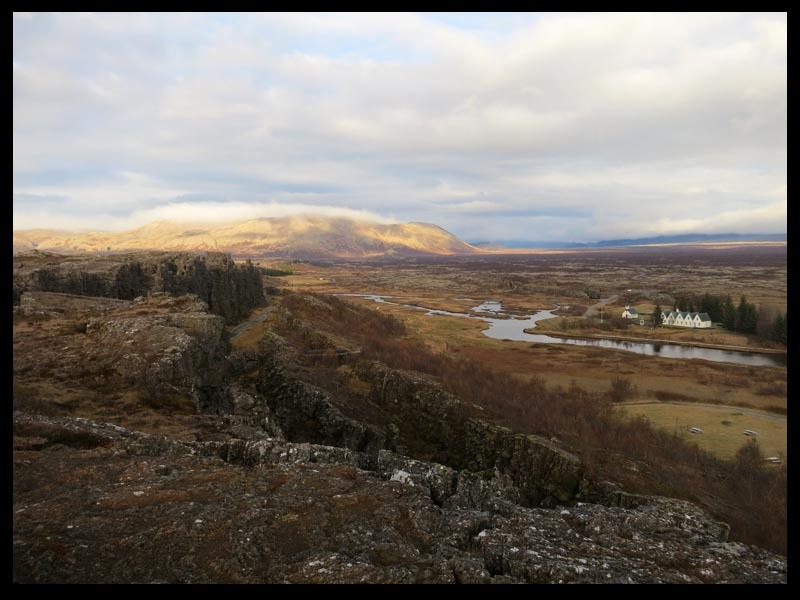 On Wednesday we were up at 7:30am for breakfast and swiftly packed onto a bus for the Golden Circle tour. By the time we transferred on, the bus was almost full, leaving us the only two seats toward the back. 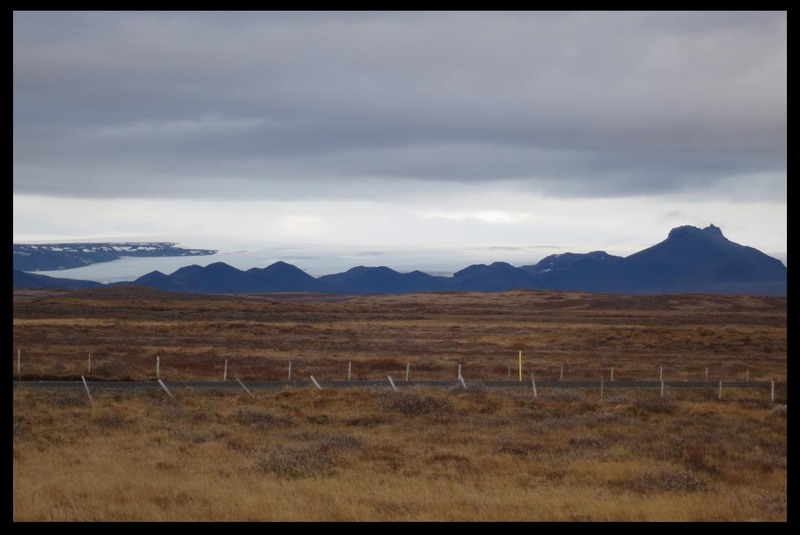 First, we headed south-east, leaving Reykjavik to heavy cloud cover, and listening to our new guide share the history of this fascinating island. The Icelandic horses and sheep are rightly well known, less known is that their attempts to raise pigs all failed, and none remain. Many charming summer houses, small and tidy, dot the landscape, and the guide clearly enjoyed tales of the elves who live in the countryside as well. 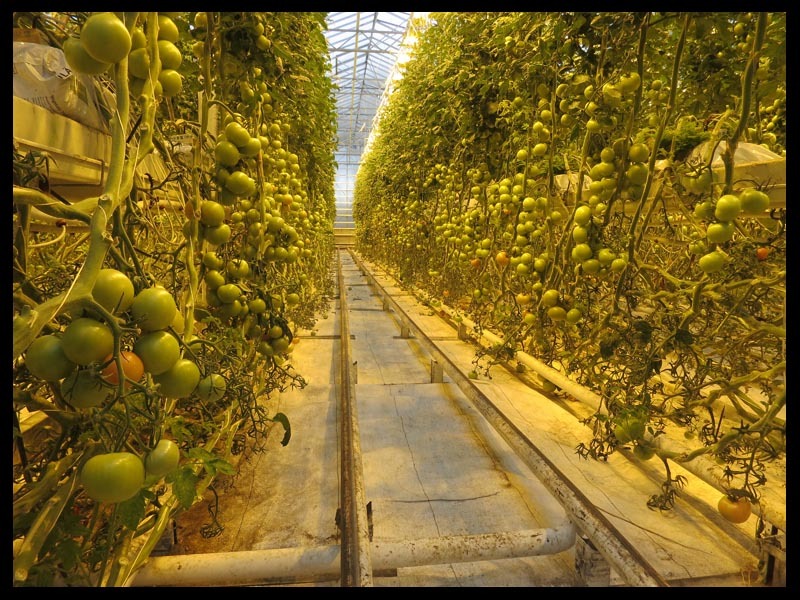 I did not anticipate a stop for tomato soup in a vast greenhouse (one never knows about the kickbacks wily tour guides arrange), but the soup (just herbs and tomatoes with basil plants one could cut and apply at will) was good, so why worry? 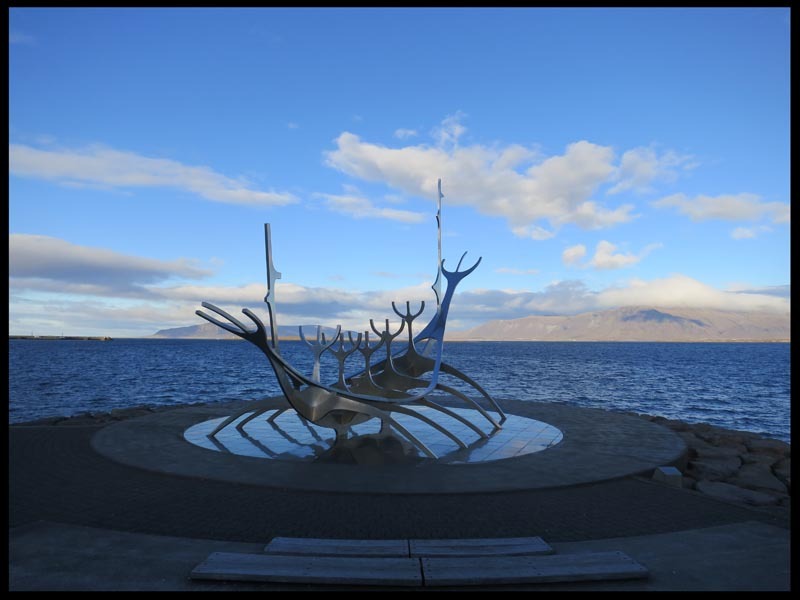 The point of the stop (beyond the obvious commerce) was to show how Iceland’s command of waters warm and cold made it an effective garden spot. The endless rows of tomato plants producing massive bounties on almost no soil was indeed interesting. Their importation of bees (one of whom clearly found both Venetia and I irresistible) without a desire for the complication of a hive (lady bees are useful, but male bees just make things complicated) seem prone to unwanted interruption and unsustainable in the long run, but so far they seem have outsmarted nature on this strange moonbase of an island. 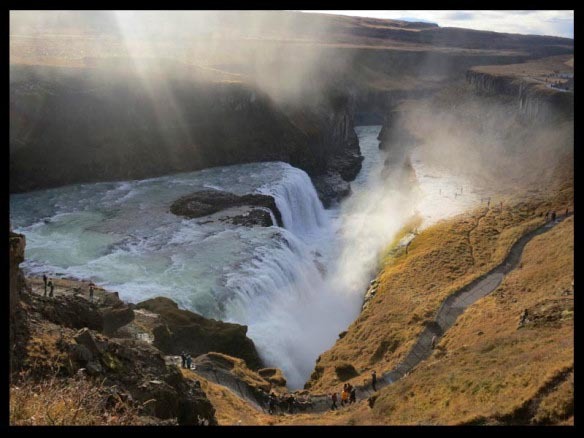 Next we visited Gullfoss or Golden Falls, this massive waterfall is an astonishing multilevel diagonal cataract, and but for the dogged efforts of Sigríður Tómasdottir this important site would even now be a giant Hydroelectric plant…. We looked down from the upper palisade at obnoxious tourists who’d chosen to ignore the careful guidelines for their safety and trod out onto the snowy and icy rim of the chasm. While we found their behavior galling, I must admit that their stupidity has given our photos a fine sense of scale…. Looking at the sweet little creek above the waterfall, one might be forgiven thinking that no danger lurked, but as the sun shone free of the morning clouds, the spray of the falls was visible for quite a distance. Bigger still, the enormous glacier visible to the north swallowed a mountain the way the ocean wraps around the land. But the glacier’s “sea-level” is not level at all, rather, it’s a hard-to-fathom diagonal. Quite disorienting and wonderful. As we were exiting through the latest in the long line of gift shops, we saw a figure who reminded us of Journey, the game we had played in New Zealand. We named her Aurora and brought her with us. Unaccountably, as we shared the local lamb stew, on view in this massive tourist dining hall was an episode of Scooby Doo featuring Harlan Ellison and Cthulhu. Ah, the profundity of our cultural exports! 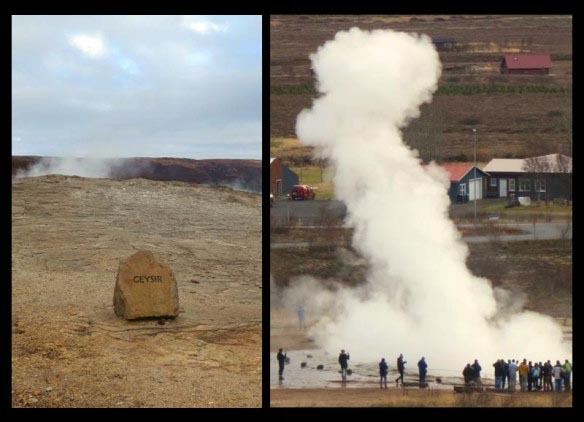 We’ve been to geysers before, but this was the original accept-no-substitutes Geysir. The same fools who tempted the edge of the icy falls made themselves clear here as the obnoxious father modeled idiot behavior for his teen offspring. He crossed the ropes and thrust his hand into the hot water. He and his children walked all over the geysers. Even as the largest among them fired off a spectacular plume every ten minutes or so. It was lovely, but compared to Yellowstone quite tiny. We napped a bit en route to the site where the plates of 2 continents (Europe and the US) meet, and where the citizens of Iceland meet for the Althing. 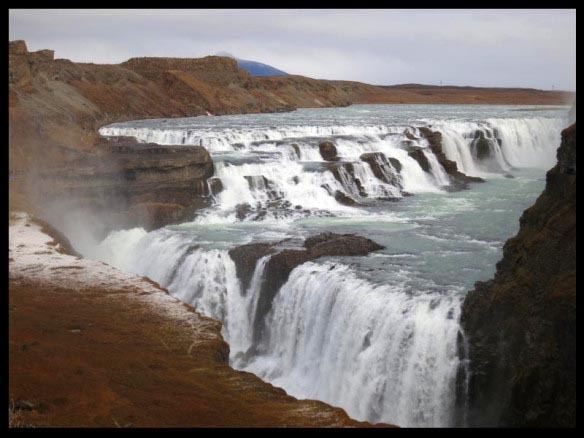 I longed for a close look at the falls to the north, but time was short and we walked south to the old camping and meeting site where the crag opened up and gave a view of the waters and plains below. The Obnoxious Tourists (TM) continued to be obnoxious of course, and we silently thanked the powers that be that they weren’t American…. 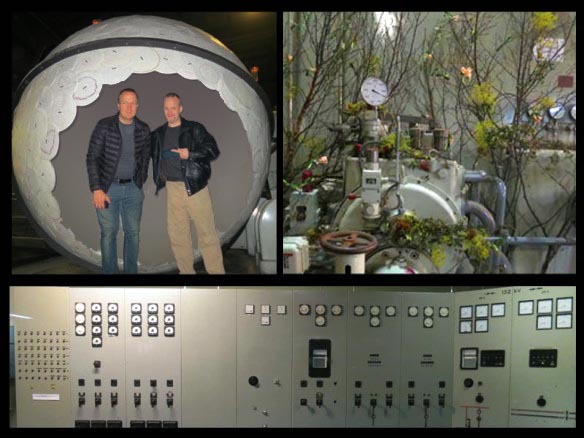 Dials and levers and electricity (still working?) for film and television. After the tour Andri and his wife treated us to a dinner party in their home. Their own children were largely inconspicuous, but the two and a half couples they’d invited made for great dinner conversation. They numbered a jazz player and composer, theater director, artist, designer, and craft artist among them. Andri’s wife upholds the long Magnason medical traditions as a nurse. All spoke flawless English and kindly did so while we were there – humoring our sadly monoglot ways. I could try to describe the warmth and beauty of the scene, but suffice it to say that it resembled nothing to me so much as a scene of the ideal European house party you might see in a film – all the people handsome and well spoken, piles of sushi and home-made rhubarb crumble, obvious long-time affection and mutual respect. In short – the party of the year! 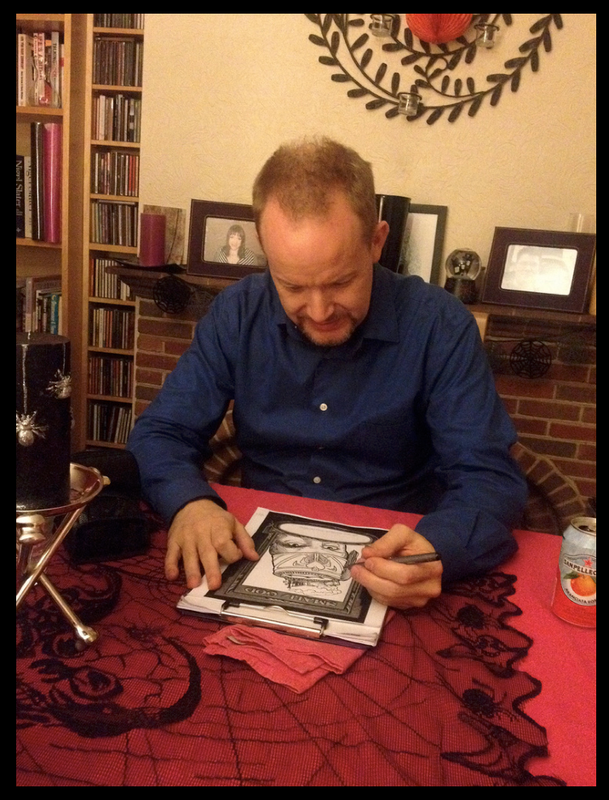 After the first guests had left, we moved down to the living room, and talked about design, music, Small Gods, and Andri’s books as he kindly signed copies for us. All the while, their youngest daughter lay sleeping in her improvised tent under the wooden stairs with their sweet brindled whippet (described by Andri as half kangaroo, half koala), a leg occasionally arcing out from the blanket before disappearing again. We got back to the hotel at 1, amazed to have seen so much of Iceland’s past and future in a single day. On Thursday, we slept in until 8:30 (living the high life!?) ambled to breakfast (corn flakes, the official breakfast of the dietarily restricted! ), checked out and and stowed our bags. It was snowing lightly as we walked downtown, and the city was quiet. 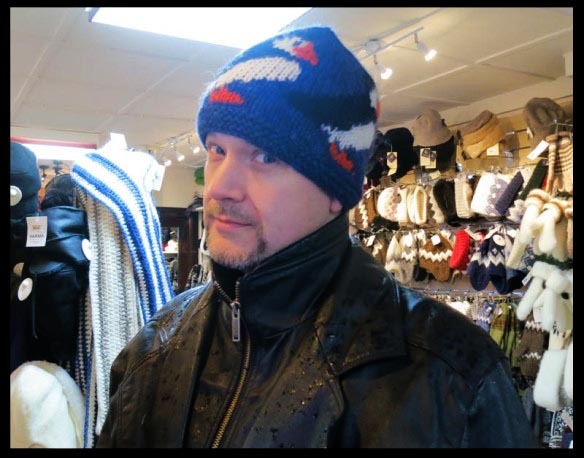 As we window-shopped, we noted the stylish Icelandic clothing stores, but luckily for our wallets, nothing was open before11am, except the wool store where we tried on silly hats. We met Andri at the big central church, seeking shelter inside for some short period before he arrived. I wonder if drawing Small Gods in church is any more blasphemous than drawing them elsewhere? When Andri arrived we went to a vegetarian place so full that we were forced to the meat buffet across the street in retaliation. After lunch we grabbed our bags, and the bus to shuttle us from one hotel to another. This time the hotel, Northern Lights Inn, was an hour south of Reyjkavic. And while we were excited to visit the Blue Lagoon, first we needed a serious nap. 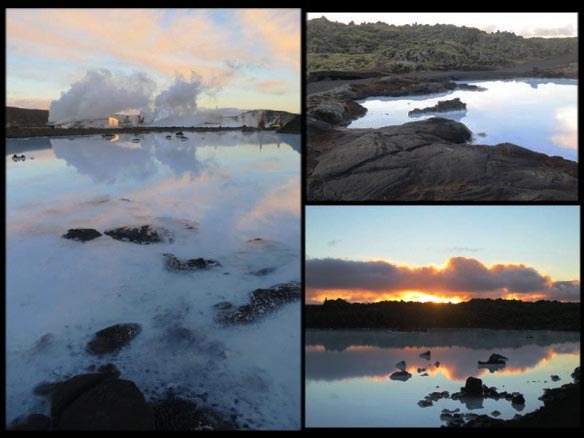 The hotel shuttle dropped us at the Blue Lagoon just in time for sunset, and reflected colors in the milky blue water outside were amazing. 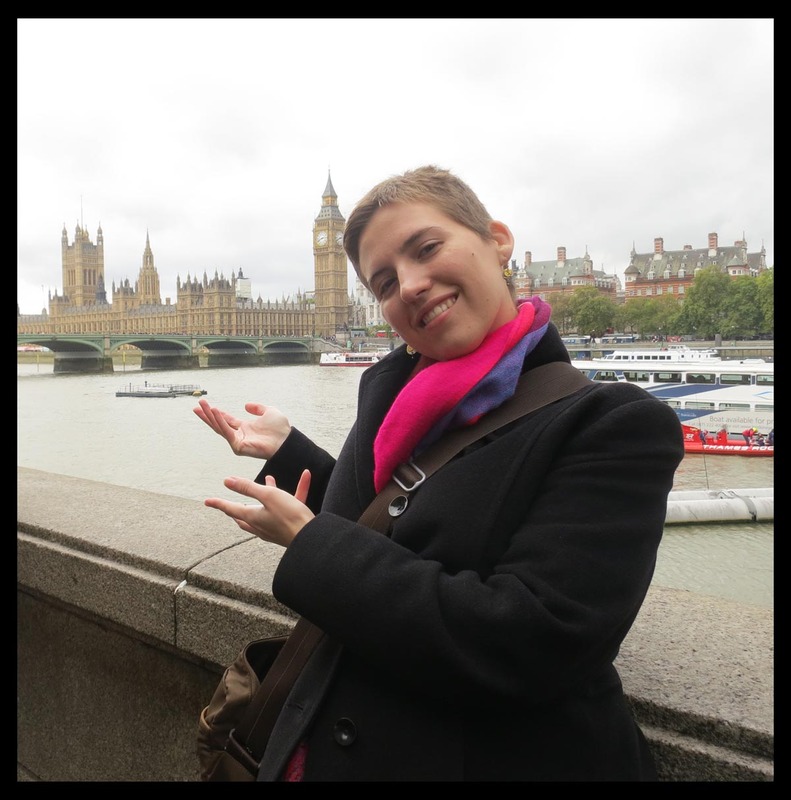 Venetia had a wonderful time taking pictures. One of the Lagoon’s traditions is making mud masks for one’s face. Venetia’s hands were small enough to get through the cracks to the mud bucket without the tiny scoop so she slathered us both with mud. 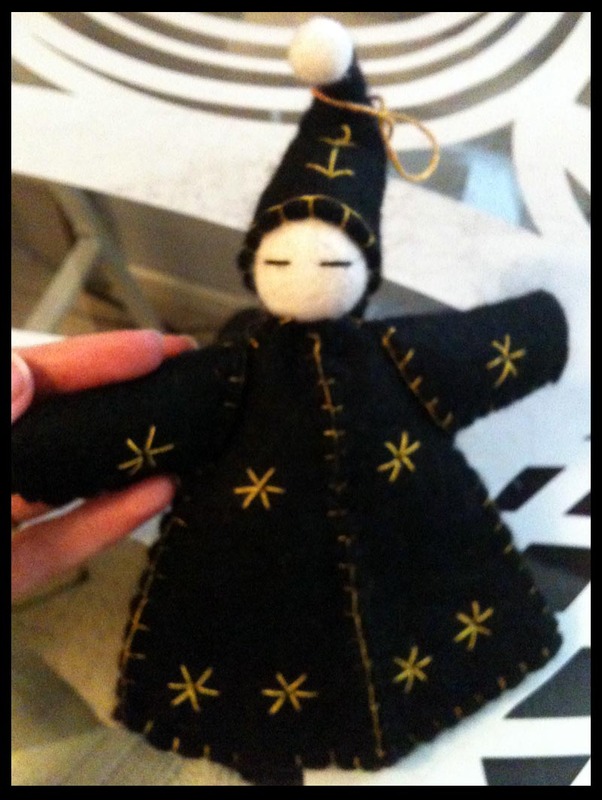 This meant it took a really long time to dry, and that we looked like golems. She got too cold to let her mud mask set fully, but enjoyed the sensation of its removal all the same. As the darkness came on, we explored all the bits of the lagoon – the soaking areas, the grotto, the bridges and the entire perimeter. We had all manner of fun in our explorations, but were occasionally surprised by outcroppings of stone and rocks from the bottom. We encountered a wedding party in matching swimsuits and flowered swim caps, the men dressed identically to the ladies, save for their bow ties. 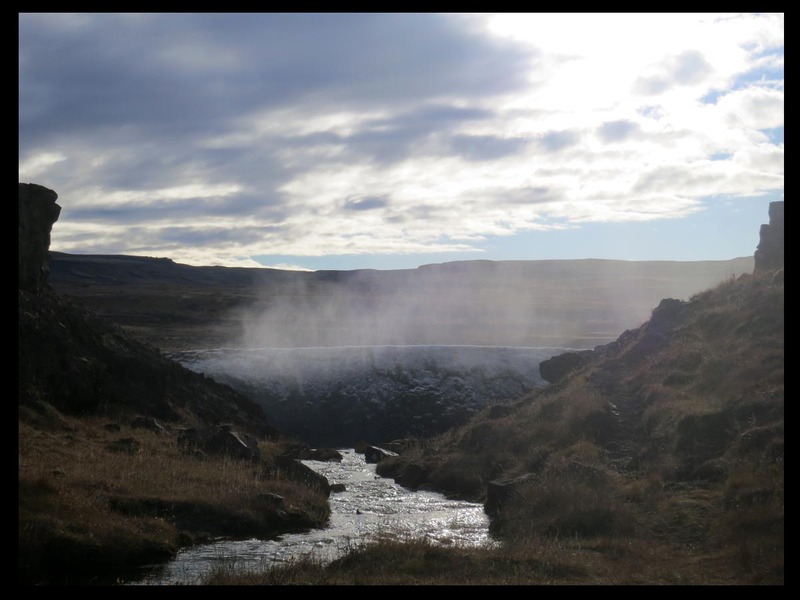 The Blue Lagoon is very expensive, and while this tends to dissuade the natives from visiting (there are countless other, more convenient and vastly more affordable springs) it was clear that exceptions were made for big events. As well the man wading into the lagoon balancing a huge tray of cocktails might have told us, were he not struggling so valiantly not to spoil a drop. We stayed until closing, and while Venetia was sad to have left our silver Ambercon thermos, I wonder what Icelander might be using it even now. The next morning we arose in the black of night and e glow of the nearby power plant, stumbled through the morning ritual of cornflakes, and hopped on a plane to England. Part One of the trip was over. What would next lay in store? All we knew for certain? More napping.